Thieves tried unsuccessfully to load the Platte Valley Bank ATM machine early Monday [April 16] morning. The machine was destroyed but no cash was removed. Early Monday morning some would-be thieves were successful in making a mess at Platte Valley Bank and highway 30, but that’s about all they accomplished during their attempt to steal the bank’s ATM. On Monday at 4:16 a.m., Dodge County Sheriff’s deputies were dispatched to the Platte Valley Bank in North Bend on the attempted theft of the bank’s ATM. The ATM machine has 24-hour access and is located inside of the building on the south side adjacent to Highway 30. 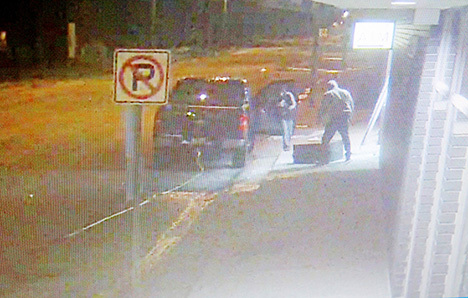 At approximately 4 a.m., two unknown subjects pulled the ATM from the building using a tow rope attached to a pickup truck. The two subjects, who were wearing hoodies that were pulled tight around their faces, were unable to load the ATM into the vehicle and left it lying outside the bank building. No money was removed from the ATM. The subjects left the scene in an unknown direction in a dark blue or black Chevrolet 4x4 pickup truck. This crime remains under investigation. Anyone with information is asked to call Investigator Mike Ough at 402-727-2700. A message can also be left on the DCSO Facebook page. Douglas County CSI Unit assisted at the scene. Highway 30 west of Main Street in North Bend was closed for three and a half hours during the investigation. Platte Valley Bank CEO Katy Bode said that the full coverage security the bank has was an asset. She said the bank has some great video and still images of the early morning heist attempt. Bode said ATM machine thefts are rarely successful. Bode said the ATM machine is beyond repair and will have to be replaced. It will be two to three weeks before the new ATM machine is in service. Meanwhile, Platte Valley Bank customers are encouraged to use the ATM machine located in the North Bend Mini Mart.